Šri Šiva as the Šiva Linga, without a human form, the most common way to depict Šri Šiva. Linga, meaning symbol, symbolizes Šri Šiva, just as smoke symbolizes the existence of fire. A Linga is commonly described as having three parts, each one representing each of the Trinity – Brahma, Vishnu and Šiva. It is also interpreted as the union of both Šri Šiva and Šri Pãrvati. 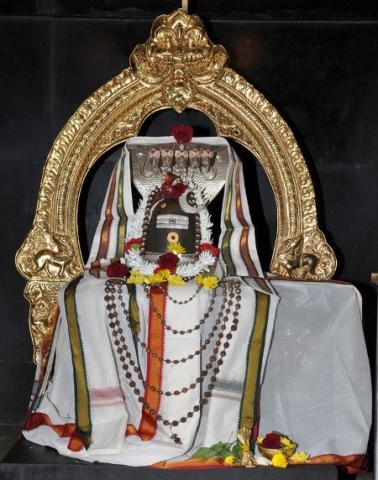 ŠRI NANDIKEŠWARA : The faithful bull seated in front of the Šivalinga is Šri Nandikešwara, the Divine vehicle of Šri Šiva. He is such an integral part of Šri Šiva that devotees pray to Him first to obtain His permission before praying to Šri Šiva. It is also customary to look at Šri Šiva through the gap between the two horns of Šri Nandikešwara. Some devotees even whisper their prayers in the ears of Šri Nandikešwara trusting that it will reach Šri Šiva’s ears right away. The small spherical shaped granite block with a flat top is the bali peetha, the traditional spot to place offerings to Šri Šiva.